Protesters aren't messing around with these signs. After months of back-and-forth negotiations, three rejected tentative agreements and work-to-rule job action, the conflict between the Nova Scotia Teachers Union (NSTU) and the provincial government has come to a head. For the first time in its union's history, teachers across Nova Scotia are on strike for the day. The historic labour action is happening while the provincial Liberal government tries to rush its Teachers’ Professional Agreement Act through the legislature. The Act, which would impose a new contract on the province's 9,300 teachers, already went through first and second readings, and was pushed through overcrowded Law Amendments Committee meetings earlier this week. Around 400 members of the public tried to air their grievances about Bill 75 during the Law Amendments Committee meetings on Wednesday and Thursday, but only some 100 were actually allowed to speak. Karin Martin, a teacher and parent of school-aged children, was one of Thursday’s presenters. Multiple motions to extend time for additional presentations during Thursday's meeting were shot down by the committee's Liberal members. Written submissions from presenters are available here. Debate on Bill 75 has continued overnight and will likely last throughout all of Friday. 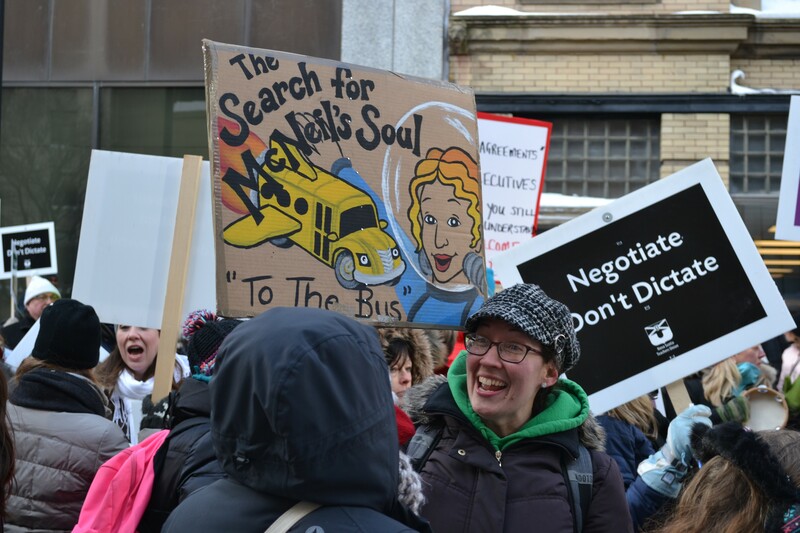 Meanwhile, thousands of teachers and supporters have been protesting outside Province House overnight, and those demonstrations continue today. The union’s members initially voted in favour of work stoppage back in October, after two previous tentative agreements with the province were rejected. In December, after last-ditch talks between both sides broke down, teachers began working to rule: only performing contractually-obligated work. In other words, they were no longer responsible for activities such as extracurriculars or field trips. The province responded by locking students out of school on December 5, claiming work-to-rule made for an unsafe environment. That move came under fire—by students, parents and opposing political parties—and after hundreds protested outside Province House the government quickly back-pedalled. Hundreds of Nova Scotian students have shown their support for teachers, including participating in walk-outs and rallies. Other students are calling for teachers to end work-to-rule as soon as possible. A mass rally featuring NSTU members, supporters and any and all available union members is being planned for noon outside of the Legislature. It's expected to be one of the largest political demonstration in Nova Scotian history. Work-to-rule didn’t create a crisis in our public school system—it made visible the crisis that was already there. Work-to-rule will be phased out starting Monday.